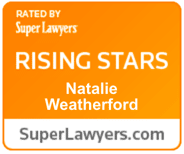 Taylor & Ring Trial Attorney Natalie Weatherford focuses her practice on representing both children and adults in sexual harassment, assault, abuse and misconduct cases, as well as catastrophic injury and civil rights litigation. $25.3 million verdict on behalf of client who was sexually abused over the course of four years at the Westerly School in Long Beach. $5.4 million verdict for a 14-year-old girl who was sexually abused by her ninth-grade teacher. $5 million settlement on behalf of child who was sexually abused by her junior high school teacher. The litigation of this case led to the enactment of Civil Code Section 1708.5.5 and Evidence Code Section 1106(c) which changed the laws regarding consent evidence for minors in California. S.M. v. Los Angeles Unified School District, Elkis Hermida. $4 million settlement on behalf of a woman who was raped at gunpoint in a Los Angeles shopping mall. The case involved premises liability and negligent security against a mall owner and security company. $3.5 million settlement on behalf of several children who were abused by their elementary school teacher. $2.5 million settlement on behalf of 3 young men who were sexually harassed by their male supervisor. $2 million settlement for a young girl who was verbally harassed, but never physically touched by her high school coach. Jane Doe v. School District. $1.1 million verdict for a 52-year-old man who sustained a back injury when rear-ended in stop-and-go traffic.